Prepare a hot grill fire or heat a gas grill to 450℉. In a medium saucepan combine rice, 1¾ cups water, and ½ teaspoon salt. Bring to a boil, cover, reduce heat to medium-low, and simmer until tender, 12 minutes. Transfer rice to a plate and cool. Brush peach with 1 tablespoon oil and grill, turning once, until charred. Slice. In a small jar combine ¼ cup oil, vinegar, honey, mustard, pepper, and ½ teaspoon salt. Place lid on jar and shake well. 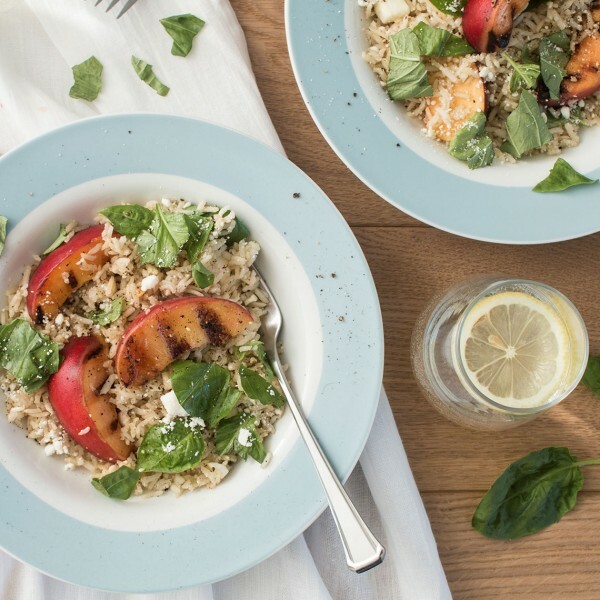 In a serving bowl toss rice with dressing, peach slices, basil, and feta.